We are among the reputed manufacturers and suppliers of an extensive range of Brass Small BCN Nozzles that are profusely appreciated among the customers for its lesser maintenance and flawless functioning. Client purchase these at reasonable rate. - Orifice Available in 0.7, 0.8, 0.9, 1.0 and 1.2 mm spray angle 0° as per client requirement. - Available in SS304, SS316, insert ruby, ceramic, tungsten carbide brass. 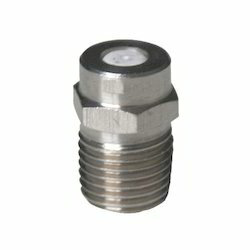 we have been able to provide the customers with a commendable assortment uniquely designed Jet Nozzle. Suitable for a plethora of safety equipment & tools, the range is extensively used to provide unhampered floe of fluids. 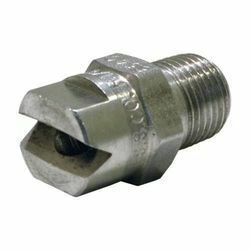 We take pleasure in introducing ourselves as leading firm by offering Jet Nozzle. We are a remarkable entity, engaged in offering an excellent range of Steam Jet Nozzles Manifold . Our offered nozzles are manufactured by our skilled professionals using high grade raw material and progressive technology. We strictly checked our offered products, in order to deliver a flawless range at the clients' end. Design/Application Data : The "Kripton Fountains" High jet Nozzle is Special Nozzle that is used to achieve greater Fountain Height, preferred in Floating and lake fountains. Jet Nozzles are required where the supply air from the diffuser has to travel a large distance to the occupied zone e.g. large halls, warehouse, shopping malls, assembly rooms etc. these diffusers/nozzles can be installed in the ceilings or side walls. Vertical jet nozzle create a single column of water. It can look good in both single and group used as per Accordingly.